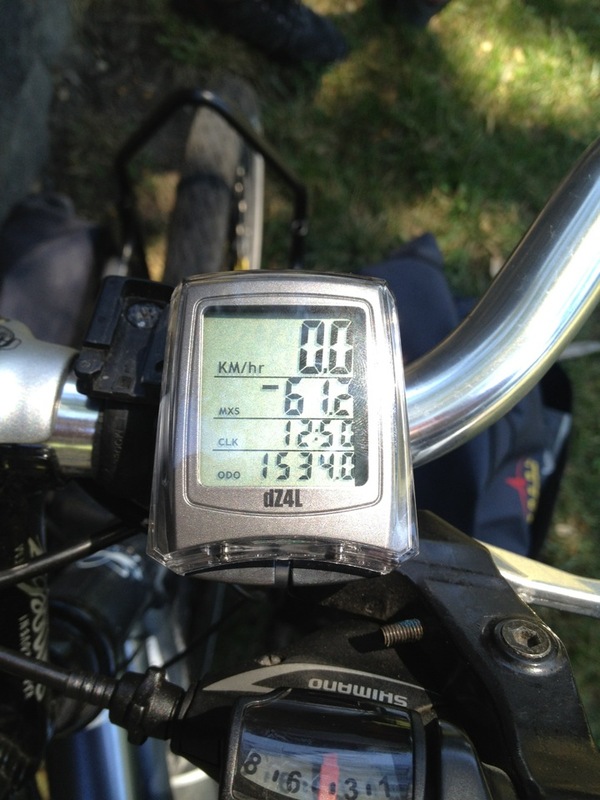 500 Kindnesses Ride Day #19: We made it! Today this would be true. There would be no sleep til Brooklyn for us: We would drop off our bike in Central Park and then head to Brooklyn where we would meet our final Couchsurfing host of the trip. We packed our panniers for the last time and made our way down to our host’s kitchen where they’d prepared a big breakfast to send us off. And before we knew it, we were on our way south along Bicycle Route 9. Just after we left the house we hit a big hill, one that our host told us would be the only major one before NYC. And he was right. It was strange to realize that this would likely be the hardest we’d have to work for the rest of the trip. The last new state we’d enter. 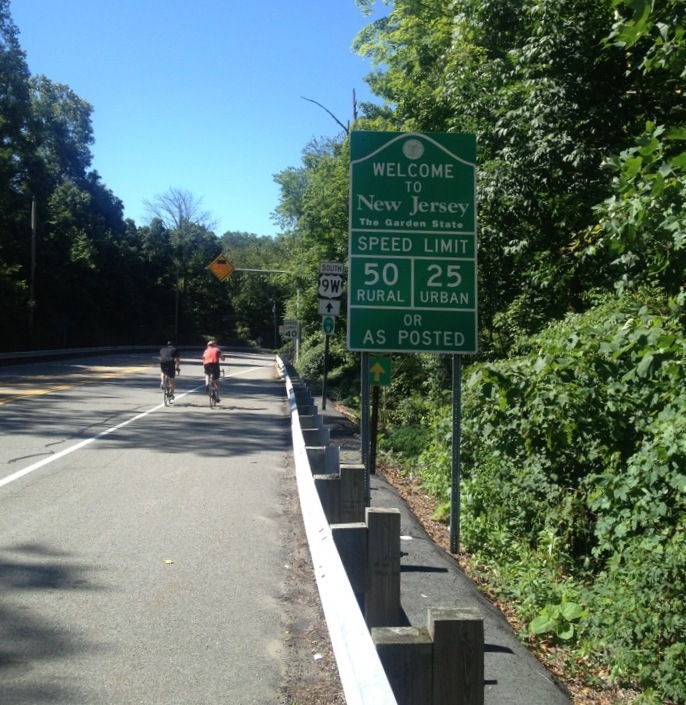 Though it may seem counter-intuitive, to get to New York City, the best way for us was to leave New York, follow Bicycle Route 9 into New Jersey through the Palisades. As we got closer to New York City we saw more and more cyclists on the road, mostly roadies on lightweight racing bikes passing us like a small sports car might pass a long haul tractor trailer. One of the riders, however, pulled alongside us and asked us about our trip. Before leaving he asked a question that many people before him had asked: “What are you going to do with the bike when you arrive?” Knowing that Daegan was getting bigger and was visibly outgrowing the bike even during the course of the trip, we had decided to donate it. We had a plan to call a volunteer from Achilles International when we arrived. Once there, the bike would be put into service in an organization that pairs up sighted volunteers to act as tandem captains with blind or visually impaired riders cycling as stokers. When we told our fellow cyclist about this he was really interested. He hadn’t heard of this organization before and as it turned out he was an Opthamologist and ocular surgeon in Manhattan this was especially good information for him to have. He wished us a good rest of the trip and sped off. As we got into a more urban area of New Jersey we heard the sound of a loud diesel engine approaching from behind. Soon the roar of the engine was joined by frantic honking. Knowing how vulnerable we were on our bike I tensed and prepared for evasive action. And then the source of the noise made itself known. There, slowly passing us was Paul, our previous night’s host in the big truck he used for his portable welding business smiling, honking and excitedly shouting “You’re almost there! !” Daegan and I were both thrilled – we’ll always remember it as one of the happiest moments of the trip and we still talk about it months later. Finally we came out of the trees and saw an exciting sight. 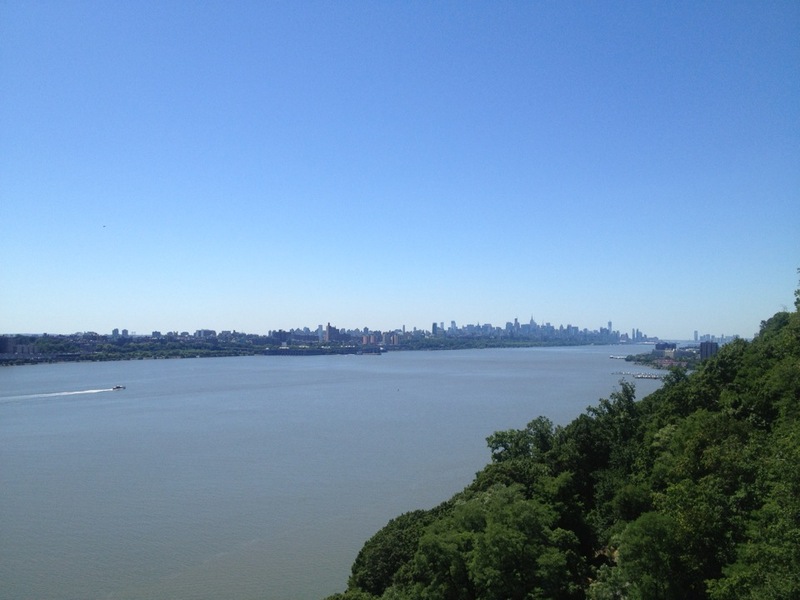 There, ahead of us, was New York City and the George Washington Bridge. We made our way to the span, and with all the traffic on both levels we were really glad to know that there was a bike path separate from the motorized traffic. The end is in sight. 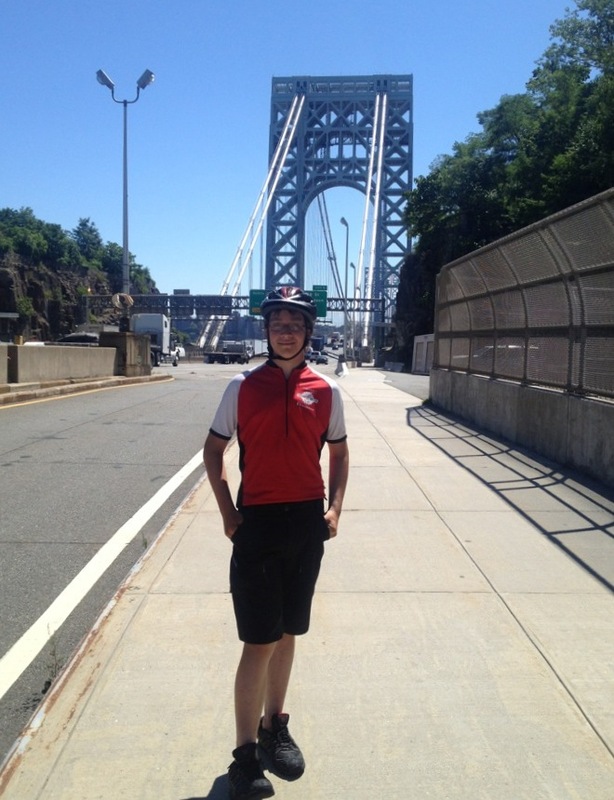 Daegan on the New Jersey side of the George Washington Bridge. When we got to the other side, another cyclist asked us where we had come from and we told him about our trip. It was really interesting over the course of the trip to see how people’s reactions to the idea varied from place to place. Throughout most of the ride, particularly in rural areas, people were surprised and many thought we were crazy for taking on the ride. But in Montreal and NYC in particular, people were not surprised at all. Spending weeks on the road on a bike was completely normal. When we got to the other side we were unsure of where to go and we asked the cyclist how to get to our next goal, the Hudson River Greenway. Instead of giving directions, he just told us to follow him and we rode through the streets of Upper Manhattan until we got to the path that led us the trail. The trail eventually took us to where we needed to get off and we wound our way through the streets of Harlem. Though we didn’t ride a great deal on NY streets, what little we did was very pleasant. Eventually, though, we arrived at Central Park and came to a stop. The ride was done. We had carried ourselves, our bike, 50 lbs of gear, and an idea we both cared about all the way to New York City. After a rest, some folks from hooplaha.com came to make a short film about our project, and so we spent a bit of time riding around the park before our contact from Achilles came along and joined us for a bit of filming before taking our bike off our hands. I have to admit, though the bike would now be too small for Daegan to ride as stoker, it was a bittersweet thing to see the bike that had traveled with us through so much being loaded into a trailer. Before the day ended and we made our way to Brooklyn to meet our final couchsurfing host of the trip, we did something we hadn’t done before in the project. We approached strangers and asked them to make pledges of their own. My favourite pledge of them all was one man who you’ll see about a minute and a half into the video who pledged to “Give an encouraging word to the next person I meet.” And then, just after he wrote his pledge down, a man in his 70s was working hard cycling by us. He immediately dropped everything he was doing, turn to the man and with tremendous sincerity and enthusiasm told him what a great job he was doing and “You can do it!”. And the man visibly brightened. Nothing has better illustrated why we started this project than that. A few weeks later an email arrived with a link to our video in it. Thanks – the producers did a really good job of making it. They also came up with the idea of encouraging New Yorkers to make pledges of their own. Part of why I chose New York City as a destination is that in North America it has a reputation for having very cold people who don’t care about others – just like Toronto does in Canada. It was lovely to see how wrong that was. Looking back I like imagining how our bike is still there, being used on weekends, promoting the kindness of people who can see volunteering to ride with those who cannot see well enough to ride on their own. Wow and deagan looking so innocent in this video and complet copy of sage . It’s so true! 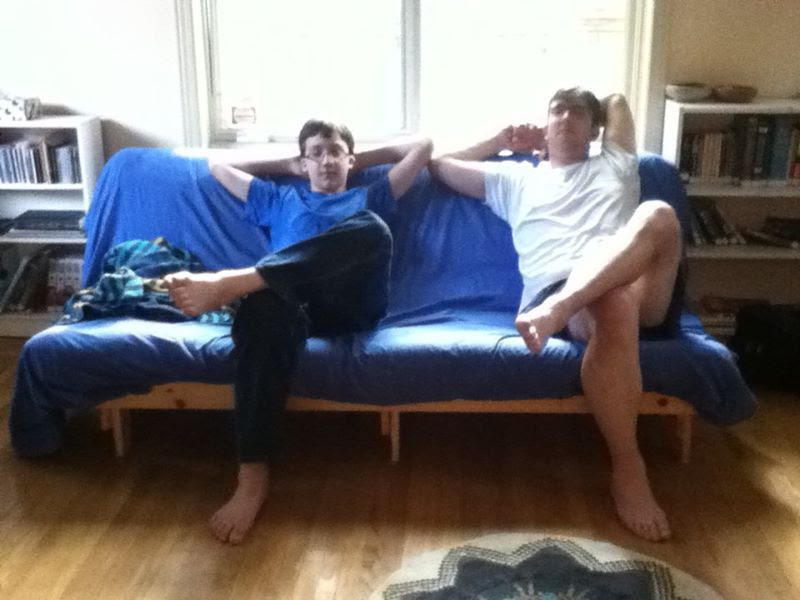 For much of his early life he looked as if he had only one parent: Sage. They were almost like twins born 26 years apart. As he got older, we could start to see a bit of me. And now there’s a lot of resemblance between us and not just in appearance but speech patterns and action. There will be times where Sage will stop in the middle of talking to us and start laughing because she notices that as we are talking to her we are sitting exactly the same way with the same expression on our face without even realizing it. That’s really awesome that you decided to donate the bike but how did you get home then?! I can’t believe how far you guys went on a bike, it was truly amazing to just read about. Everything we had fit in a total of six small bags. so we just bought a pair of train tickets and rode home. It was about a 9-10 hour ride. The first hour or so of the ride went along the same river we had just come down. It was both cool and sad at the same time to watch it all go by.